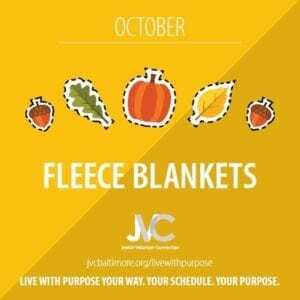 As we prepare for colder weather, join JVC and Live with Purpose by making fleece blankets for people who could use some extra warmth this season. Who are we helping? 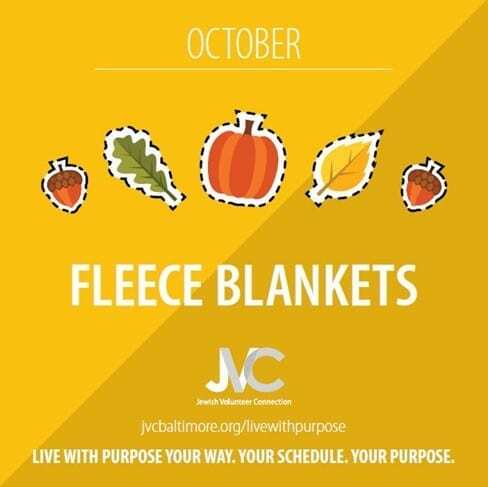 Fleece blankets will be donated to various organizations in Baltimore that help support those in need in our community. Our recipient partners include Sinai Hospital and My Sister’s Place . Choose fleece, any color or style that you like! Line up the two fabrics, right side out. Trim both to the same size. Cut a 5-inch square from each of the four corners. Cut fringe on all four sizes of the blanket. Cut through both layers of fabric at the same time. Fringe should be a little wider than the width of your finger and about 5 inches deep. With all the fringes lined up, start tying knots (tying together the top and bottom fleece). Work your way around the fleece blanket. Did you know? At least 3,500 people in Baltimore experience homelessness on any given night, totaling more 30,000 people each year. Learn more by using our resource guide! If you are interested in obtaining supplies for this project and supporting JVC’s Live With Purpose, see below. Your gift represents a charitable contribution.